Twitter fell more than 8% early Thursday amid a lack of any news or Wall Street downgrades. The selling was “completely technical” according to a veteran floor trader at the New York Stock Exchange. 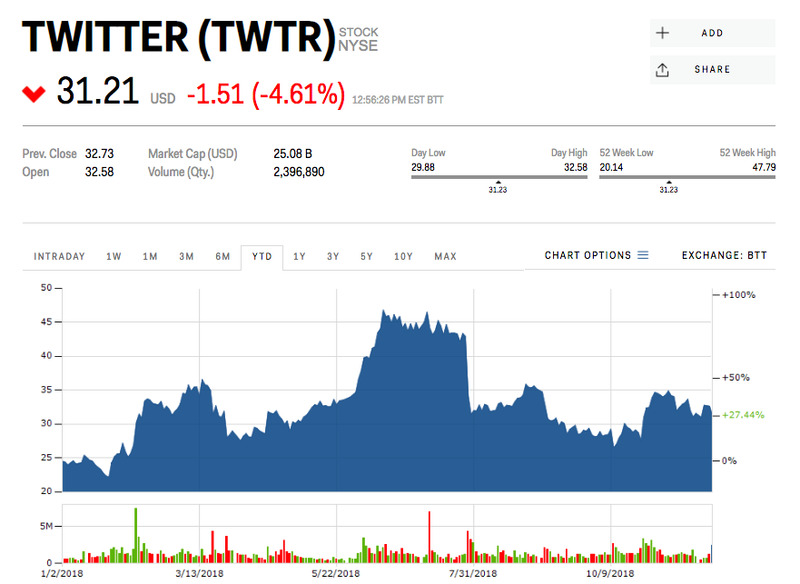 Twitter shares fell as much as 8.53% early Thursday amid a lack of news and headlines, to their lowest level in more than a month, and one veteran New York Stock Exchange floor trader trader says to find the reason all you need to do is look at the charts. “It’s completely technical,” said Kenny Polcari, managing director at O’Neil Securities. “Over the last couple days Twitter failed at $US32.16/32.20 where it hit a downward trend resistance line. It had to fill the gap which is exactly what it has done.” Polcari says shares could trade as low as $US29.77 – they fell to $US29.87 earlier on Thursday. Twitter shares have been under pressure since July amid the fallout from Russian interference in the 2016 presidential election. The stock has shed more than 28% since its second-quarter earnings report out in July warned of a decline in the number of new users. At the time, the company pinned the decline on new European privacy rules, its decision not to move to paid SMS carrier relationships, and on its efforts to clean up the platform. But before Twitter’s warning, its stock had been one of the top performers on the Nasdaq, trading up 80%, after posting a profit in two consecutive quarters. Twitter has pared its losses over the course of Thursday’s session, and now trades down 4.61% at $US31.21 a share. It was up more than 29% this year.